Give a classic gift, with this stylish cushion signet ring in elegant 9ct gold with delicate diamonds to add just a touch of sparkle. Why not have it engraved to make it even more personal? 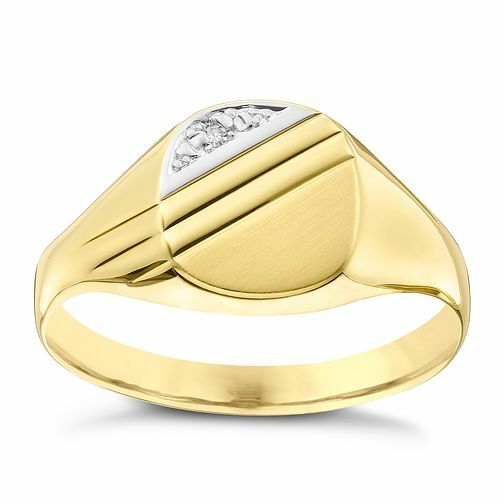 9ct Gold Diamond Set Cushion Signet Ring is rated 3.8 out of 5 by 8. Rated 5 out of 5 by Anonymous from This product looks great My boyfriend just love it <3. I'll certainly order things from them. The product is quality and looks great. Rated 5 out of 5 by Anonymous from Man signet ring Very well made and the fit was exactly right. It looks really good.